Looking for an easy to prepare pasta salad that you can make a day or two ahead of time? This is the perfect salad for you. 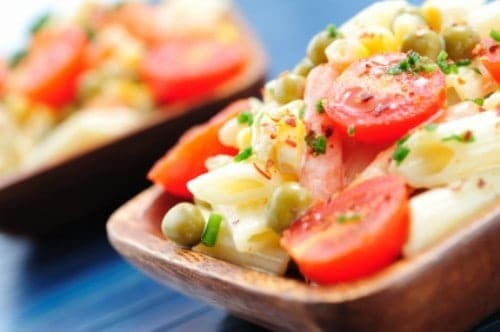 This Mostaccoili Salad is a great pasta salad that is perfect to serve when you want a light and refreshing pasta salad. Mix together oil, vinegar, sugar, salt, pepper, garlic powder, and mustard. Pour this over drained noodles. Mix well and refrigerate 18 hours. Stir occasionally to coat all noodles. This salad gets better as it sits. Raw vegetables could be added to this also. The recipe comes from Sue A. Mertens Minick from Hazelwood, MO. She actually found this site on the internet! And yes, turns out we are related! This was a great pasta salad.